Welcome To A Whole New World of Ultra-Luxury Canvas Safari Tents, Eco-Lodge, Island Dwelling, Spa, Tree House, Alternative Living and Resort Tents. With its origins in Safari-Tented Lodges out of Africa, Exclusive Tents International specializes in supplying a unique range of ultra luxury canvas tented accommodation around the globe from Australia to Alaska and beyond. Manufactured to perfection, our tents are designed to be eco friendly and aesthetic, to blend into their environment and are perfectly designed for Eco Lodges, Luxury Resorts & Spa’s, Health Resorts, Boutique Lodges, Tree Houses and Romantic Island Retreats etc. All of our tents leave only a green footprint on the environment, be it by the ocean coastline, on the beach, in the countryside, on an estate, remote logistical expedition base camps or as a private lake cabin in paradise. Our tents are all 4-season and do well in any climates from high rainfall tropical climates to dry desert environments, offering a unique alternative in architectural style, 5 star flair elegance and the romance of living under canvas. With our exquisite and exotic designs our tents have also been used for weddings, spas, yoga, meditation and spiritual retreats. Though our tents look like they could fit well into an Indiana Jones movie, they did appear in The Lost World, as they would in any Moroccan, Mediterranean or Middle Eastern setting. Be it the universal adventure tourist on a relaxing vacation, or someone with the will to explore remote expedition like locations, they will love the real experience of residing in our beautiful fabric structures, bringing their total experience, so much closer to nature. We can custom design your tent to meet your specific requirements or we can also make minor custom changes to existing designs to meet many of our customers special requirements. Custom Engineered To Bring You Closer To Nature And Allow You The Romance Of Living Under Canvas, To Find The True Tranquility And Absolute Pure Passion Of Life! 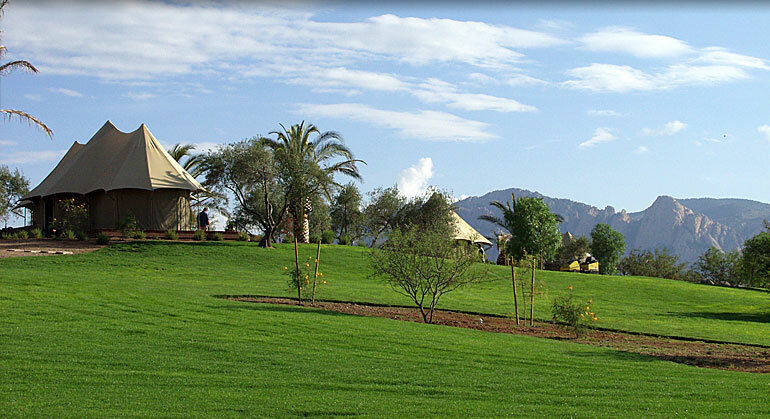 Exclusive Tents International Ltd. is a trademark of Exclusive Tents international, Ltd.